In my continuing effort to dialog with people from around the world, I am pleased to feature: "Josh In Japan". Josh is on active duty with the US Navy and also runs a top rated podcast all about Japan. 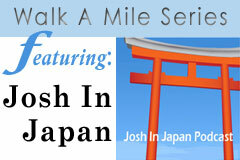 Join me in an enlightening conversation and a really informative perspective from Josh, about Japan, and what it's like for an American immersed in the local culture in The Land of the Rising Sun.